Any order from a customer for stationery from To Have and To Hold Wedding Stationery is deemed to constitute acceptance of the following terms and conditions. We reserve the right to update details or prices on our website at any time without prior notice, including our terms and conditions. Any price increase will not affect confirmed orders. To Have and To Hold Wedding Stationery cannot accept the responsibility for variations in size, colour or texture of card or other materials. Although very effort is made to make sure all items are made to highest quality, due to the majority of our products being handmade, no two products will be exactly the same and therefore may differ slightly from card to card. All products are finished to a high standard but due to their delicate accessories, they should be handled with care by the customer. 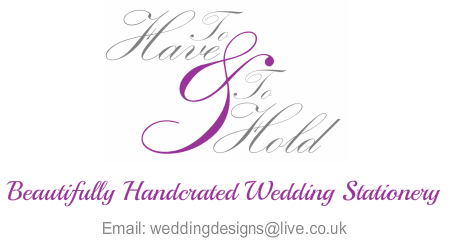 All designs on this website are copyright of To Have and To Hold Wedding Stationery. It is not permitted to copy, publish or reproduce any designs, text, images, and products under any circumstances. This also applies to samples ordered. The customer is responsible for ensuring they have permission to use any material you ask us to include on any wedding stationery (i.e. – readings and hymns). We cannot be held responsible for any breach of a third party's copyright. Content and wording for all stationery items must be provided electronically. It is the customer’s responsibility to thoroughly check and proof read all online proofs of their stationery proofs. The customer must confirm the proofs are correct and confirm this in writing. Once they have been approved by the customer To Have and To Hold Wedding Stationery are not responsible for any mistakes discovered afterwards on the approved stationery proofs. Once the proof has been confirmed as correct, any amendments may incur a charge. Production of stationery will not commence until the proofs are approved by the customer. Any changes requested by the customer after production has commenced will be charged to cover the cost of the items already made. Failing to confirm the proofs within our timescales could mean a delay in your order being sent. Delivery costs will be charged on size and weight and added to your final invoice. All orders will be sent via Royal Mail Recorded/Special delivery or via a courier. A signature will be required to confirm receipt of delivery. An order will only be confirmed once a 50% deposit has been paid. The 50% deposit is Non-refundable. The deposit is required before work will begin on any wedding stationery proofs. The remaining 50% must be paid once the final online proof has been approved by the customer. The remaining balance is required before work will begin on any wedding stationery. Orders can be cancelled as long as final proofs have not been approved and production has not commenced. If we are due to complete your order within 6 weeks of the cancellation date then the full balance must be paid in full. If you wish to cancel after production has started you will be charged for those items made. Once work has commenced on your order then we have the right to collect the final payment. A delay in making a payment at any stage may result in a delay of your order being sent. All items remain the property of To Have and To Hold Wedding Stationery until paid for in full. Please note that due to each product being handmade to order we do not offer a refund on unwanted products. Please be aware that due to some small parts on our products, they are not suitable for young children.